Please enjoy today’s feature A Change of Heart by 5th grader Daphne Graham. “”December 18, 1941,” Amaya wrote at the top corner of her journal. “The war continues. Only eleven days after the attack on Pearl Har-,” she dropped her pencil. Quickly standing up, knocking her chair clear behind her, she slammed her clammy hands on the top of her desk and shut her journal. Panicking, she darted her hands forward to pull her curtains together. “Okasan! Otosan!” She yelled into the kitchen where her mother and father were fixing themselves lunch. “Soldiers!” She pointed to the window. Amaya’s mother and father raced towards the kitchen window. Amaya and her mother followed his orders as Amaya’s father answered the door. Three powerful pounds crashed against the other side of the door. Amaya’s father’s shaking hand reached for the doorknob while Amaya and her mother peered fearfully. As the door opened, the two largest soldiers instantaneously took hold of Amaya’s father’s arms. “Quiet! All of you are registered to be put in a prison camp for traitors. One suitcase per person. Hurry! We need to get you on the train to the Gila River War Relocation Center in Arizona.” One soldier ordered. “Arizona? What’d they plan on doing with us in the middle of the desert?” Amaya thought, shivering in perpetual fear. Time passed and on arrival at camp, Amaya and her family walked side by side through the gates with two soldiers – American just like them. The soldier next to Amaya quickly glanced down at her and then abruptly turned away. He looked young. “Too young to be a soldier,” Amaya thought suspiciously. He appeared kinder, and seemed to act much less overbearing than the other soldiers. As her feet left the ground they kicked up dust around her on the arid desert floor. Then they connected with the ground again in anger and disappointment within every trudge towards the horse stables. Close to the horse stables, Amaya smelled the appalling scent of the living spaces they’d soon be calling home. Outside the stables, armies of century towers stood proud and tall against the fiery orange desert sky. Only making her thoughts that more frightful were the barbed wire fencing surrounding the camp like a bow wrapped gently but tightly around a box. Except this time, that box had a ribbon around it that would tear you apart piece by piece and attach a death sentence to you if you tried to escape its tight grip. Even still, Amaya saw the mountains sparkling with bright indigo and white ridges lightly pressed against the horizon alongside the sun’s stunning rays. She whispered in awe. “Beautiful. Sketching this in my journal later.” How could everything at a place so horrid look so magnificent in her eyes? Briefly looking back at the mountains, she stepped inside the horse stable. All she saw were four blank white walls with two cots, one window, and a single stove all crammed into this minuscule area. Snapped wires hung from the walls, the paint was stripped, and the window was practically shattered. “For as long as it takes.” She replied with optimism. Three days past and Amaya sat in the camp’s hall where dinner was held. Loneliness was starting to settle in. “Okasan, Otosan,” Amaya said suddenly. “Yes, Amaya?” Her mom responded. “Yes, go ahead. Be right back here soon,” her dad interjected. Amaya headed towards their stable. The century towers’ searchlights following her every footstep. She bolted for her room and there lie her sketchbook on her cot. She heard footsteps outside that seemed to conclude at her door. Half paralyzed, Amaya stuttered. “Wh-who is it?” No response. Against her own judgement, she opened the sliding latch on her stable door. The soldier that had walked her in was standing solemnly on the other side of her door. His head faced down and he rocked back and forth on his feet anxiously. “Okay then.” She uttered dismissively. He looked up at Amaya with the most sorrowful eyes and showed his hands to her as if to say he brought no weapons with him. Amaya and her dad walked back to the hall together and finished dinner with Amaya’s mother. Multiple nights later, Amaya couldn’t asleep. Her eyes were stuck wide open like a fish. “Maybe I should sketch?” She thought sitting up in her cot. Being so dark out, she thought she saw something off in the corner of her room. She blinked, but it didn’t disappear. Again, she rubbed her eyes. Still there. Amaya crept out of her creaky bed and saw the object next to the door. A box with a note attached. Earlier today, a group of soldiers caught me delivering supplies to another family. For these reasons I have been transferred to another prison camp. Inside this box are supplies that will help you and your family out greatly. Food, water, extra clothes, etc. I wish you, your family, and all the others the best. Happy to help. Catch up on Part 1, Part 2 and Part 3 here. We hope you enjoyed the series and would love to hear from you in the comments below. 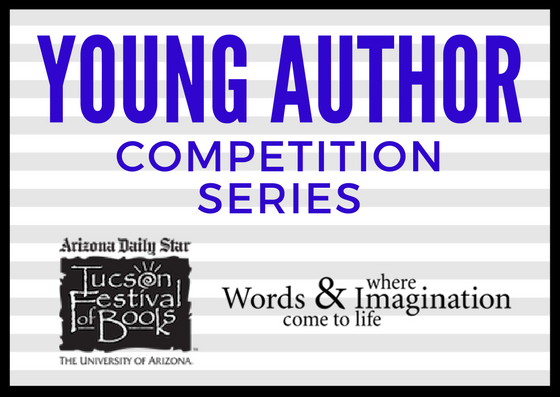 See you at Tucson Festival of Books!